An innovative, integrated hardware and software platform that allows a security site to network one or more Baggage and Parcel Inspection (BPI) 600 series advanced X-ray screening systems with a series of remote Workstations at various Screening Levels. An innovative, integrated solution that allows networking one or more Baggage and Parcel Inspection (BPI) advanced X-ray screening systems with a series of remote workstations at various screening levels. Rapiscan® Systems Network X-ray Management and Automation System (NEXlink), is designed for the integration of a combination of both single and dual view X-ray scanners with various tunnel sizes. 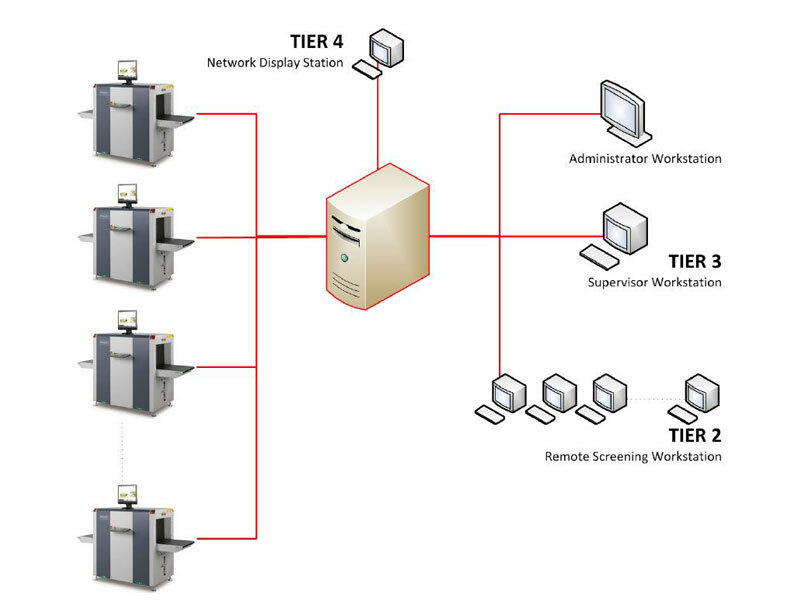 It provides a multi-layered management system capable of managing and transmitting data and images from all networked scanners to corresponding remote screening workstations used for review and decision on images. By removing the traditional one-to-one relationship between a scanner and a security operator for reviewing and evaluating every image, NEXlink allows Remote Screenning Operators (RSO) to view images from scanners within the network. This reduces the total number of staff per scanner and per lane by adding efficiency and operational cost savings, by optimizing the number of screeners in a centralized environment. it also allows more flexibility in effective staffing at peak times. NEXlink is developed with capabilities to optimize current and future baggage and parcel screening operations in any complex environment. It is highly configurable so that each NEXlink Matrix Control Server (MSC) can support multiple scanners of different types (i.e. single and dual view scanners) with various tunnel sizes. Each NEXlink installation is scalable to support up to 50 scanners.